Wow. Seriously the most overrated taco place in the world. I can't believe I am disagreeing with Anthony Bourdain's tastebuds. Maybe last Friday, 09/04/2009 was an off day for them...but their food is pretty much flavorless...as in, we even tried drenching our food with their homemade salsas and still found everything tasteless. And it's not as if we only ordered 1 taco. We f*ing ordered the whole menu bc I thought my mind would be blown away. We ordered the carne enchillada and vegetarian taco, chorizo tosatas, steak quesadilla. They forgot our chicken picada order, and we were very thankful. 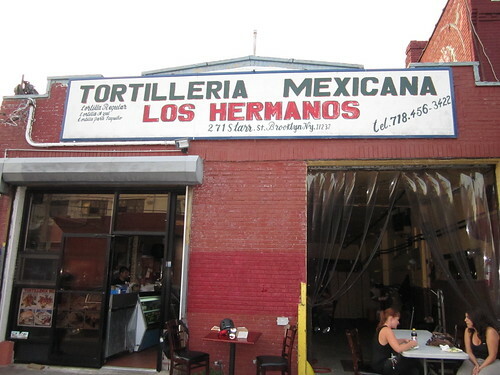 The only thing good was their tortillas, which they make in the back of the restaurant. I could buy bundles of these.